Demystifying the "Silk Road," the "Orient," and "Orientalism"
Brief definition: In 1877 the term "Seidenstraße" (literally "Silk Road") was coined by the German geographer, cartographer and explorer Ferdinand von Richthofen. It was 20 centuries after the first Chinese missions to the West, that the term "Silk Road" began to be used. The term now refers to the centuries-old trade network that has linked the Asian and Mediterranean worlds since antiquity (and often includes not only overland, but also maritime routes). The term "Silk Route(s)" is also used to describe the connection of trade routes that grew into an extensive Eurasian trans-continental network. Brief definition: One who studies Oriental cultures (a.k.a. Oriental Studies). Brief definition: The scholarly knowledge of Asian cultures, languages and people. Orientalism has often been defined as the study of Near and Far Eastern societies and cultures, by Westerners. Orientalism is also a term used for the imitation or depiction of aspects of Eastern cultures in the West by writers and artists. Orientalism refers to the Orient or East, in contrast to the Occident or West (from the Latin oriens: "Orient" is derived from the Latin word oriens meaning "east," used as the word for "rising" to refer to the east where the sun rises). Since the 19th century, "Orientalist" has been the traditional term for a scholar of Oriental studies, however the use in English of "Orientalism" to describe academic "Oriental studies" is rare; the Oxford English Dictionary cites only one such usage, by Lord Byron in 1812. Orientalism was more widely used to refer to the works of French artists in the 19th century, who used artistic elements derived from their travels to non-European countries of North Africa and Western Asia. It can be argued that the most readily accepted designation for Orientalism is an academic one, and indeed the label still serves in a number of academic institutions. Anyone who teaches, writes about, or researches the Orient (whether an anthropologist, sociologist, historian, or philologist) can be considered an Orientalist. Nonetheless, the 20th century saw considerable change in the term's usage. In 1978, American-Palestinian scholar Edward Said published his influential and controversial book, Orientalism, in which he used the term to describe a pervasive Western tradition, both academic and artistic, of prejudiced outsider interpretations of the East, shaped by the attitudes of European imperialism in the 18th and 19th centuries. Said was critical of both this scholarly tradition and of some modern scholars, particularly Bernard Lewis. American literary critic Paul De Man supported Said's criticism of these modern scholars. In complete contrast, some modern scholars have used the term to refer to writers of the Imperialist era with pro-Eastern attitudes. More recently, the term is also used in the meaning of "stereotyping of Islam", both by advocates and academics in refugee rights advocacy. A particular aspect of this stereotyping, described as "neo-Orientalism", occurs in the context of forced migration, particularly affecting women, and its alleged damage to refugee rights both in and outside the Arab and Muslim world. In the later Roman Empire, the Praetorian prefecture of the East, the Praefectura Praetorio Orientis, included most of the Eastern Roman Empire from the eastern Balkans eastwards; its easternmost part was the Diocese of the East, the Dioecesis Orientis, corresponding roughly to Greater Syria. Over time, the common understanding of 'the Orient' has continually shifted eastwards, as Western explorers traveled farther into Asia. It finally reached the Pacific Ocean, in what Westerners came to call 'the Far East'. These shifts in time and identification sometimes confuse the scope (historical and geographic) of Oriental Studies. Yet, there remain contexts where 'the Orient' and 'Oriental' have kept their older meanings, e.g. 'Oriental spices' typically are from the regions extending from the Middle East to sub-continental India to Indo-China. Travelers may again take the Orient Express train from Paris to Istanbul, a route established in the early 20th century. It never reached the nations bordering the Pacific Ocean, or what is currently understood to be the Orient. In contemporary English, Oriental usually refers to goods from the parts of East Asia traditionally occupied by East Asians and most Central Asians and Southeast Asians racially categorized as "Mongoloid". This excludes Indians, Arabs, most other West Asian peoples. Because of historical discrimination against Chinese and Japanese, in some parts of the United States, the term is considered derogatory; for example, Washington state prohibits use of the word "Oriental" in legislation and government documentation, preferring the word "Asian" instead. Early architectural use of motifs lifted from the Indian subcontinent have sometimes been called "Hindoo style". One of the earliest examples is the façade of Guildhall, London (1788–1789). The style gained momentum in the west with the publication of views of India by William Hodges, and William and Thomas Daniell from about 1795. One of the finest examples of "Hindoo" architecture is Sezincote House (c. 1805) in Gloucestershire. Other notable buildings in the Hindoo style of architecture are Casa Loma in Toronto, Sanssouci in Potsdam, and Wilhelma in Stuttgart. Pleasure pavilions in "Chinese taste" appeared in the formal parterres of late Baroque and Rococo German palaces, and in tile panels at Aranjuez near Madrid. Thomas Chippendale's mahogany tea tables and china cabinets, especially, were embellished with fretwork glazing and railings, ca 1753–70. Sober homages to early Xing scholars' furnishings were also naturalized, as the tang evolved into a mid-Georgian side table and squared slat-back armchairs that suited English gentlemen as well as Chinese scholars. Not every adaptation of Chinese design principles falls within mainstream "chinoiserie." 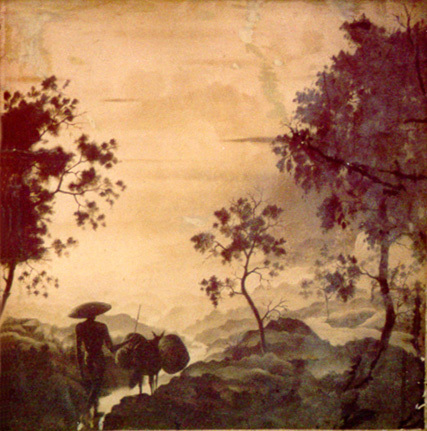 Chinoiserie media included imitations of lacquer and painted tin (tôle) ware that imitated japanning, early painted wallpapers in sheets, and ceramic figurines and table ornaments. Small pagodas appeared on chimneypieces and full-sized ones in gardens. Kew has a magnificent garden pagoda designed by Sir William Chambers. After 1860, Japonisme, sparked by the importing of Japanese woodblock prints, became an important influence in the western arts. In particular, many modern French artists such as Monet and Degas were influenced by the Japanese style. Mary Cassatt, an American artist who worked in France, used elements of combined patterns, flat planes and shifting perspective of Japanese prints in her own images. The paintings of James McNeill Whistler and his "Peacock Room" demonstrated how he used aspects of Japanese tradition and are some of the finest works of the genre. California architects Greene and Greene were inspired by Japanese elements in their design of the Gamble House and other buildings. Depictions of Islamic "Moors" and "Turks" (imprecisely named Muslim groups of North Africa and West Asia) can be found in Medieval, Renaissance, and Baroque art. In Biblical scenes in Early Netherlandish painting, secondary figures, especially Romans and Jews, were given exotic costumes that distantly reflected the clothes of the Near East. The Three Magi in Nativity scenes were an especial focus for this. Renaissance Venice had a phase of particular interest in depictions of the Ottoman Empire in painting; Gentile Bellini, who travelled to Constantinople and painted the Sultan, and Vittore Carpaccio were the leading exponents. By then the depictions were more accurate, with men typically dressed all in white. The depiction of Oriental carpets in Renaissance painting sometimes draws from Orientalist interest, but more often just reflects the prestige these expensive objects had in the period. Turquerie, which began as early as the late 15th century, and continued until at least the 18th. In the nineteenth century, when more artists traveled to the Middle East, they began representing more numerous scenes of Oriental culture. In many of these works, they portrayed the Orient as exotic, colorful and sensual. Such works typically concentrated on Near-Eastern Islamic cultures, as those were the ones visited by artists as France became more engaged in North Africa. French artists such as Eugène Delacroix, Jean-Léon Gérôme and Jean Auguste Dominique Ingres painted many works depicting Islamic culture, often including lounging odalisques. They stressed both lassitude and visual spectacle. The later Russian artist Alexander Roubtzoff was also fascinated by what he saw on travels to Tunisia. When Ingres, director of the French Académie de peinture, painted a highly colored vision of a turkish bath (illustration, right), he made his eroticized Orient publicly acceptable by his diffuse generalizing of the female forms (who might all have been the same model.) More open sensuality was seen as acceptable in the exotic Orient. This imagery persisted in art into the early 20th century, as evidenced in Matisse's Orientalist semi-nudes from his Nice period, and his use of Oriental costumes and patterns. In his novel Salammbô, Gustave Flaubert used ancient Carthage in North Africa as a foil to ancient Rome. He portrayed its culture as morally corrupting and suffused with dangerously alluring eroticism. This novel proved hugely influential on later portrayals of ancient Semitic cultures. Alexander Borodin — In the Steppes of Central Asia; "Polovetsian Dances" from Prince Igor. Mikhail Ippolitov-Ivanov — Caucasian Sketches. Modest Mussorgsky — "Dance of the Persian Slaves" from Khovanshchina. Nikolai Rimsky-Korsakov — Antar; Scheherezade. The upside down circle by Don Gilbert (1990). A central idea of Edward Said is that Western knowledge about the East is not generated from facts or reality, but from preconceived archetypes that envision all "Eastern" societies as fundamentally similar to one another, and fundamentally dissimilar to "Western" societies. This a priori knowledge establishes "the East" as antithetical to "the West". Such Eastern knowledge is constructed with literary texts and historical records that often are of limited understanding of the facts of life in the Middle East. Before Said's book, "Oriental" was widely used as the opposite of "occidental" ('Western'). The comparisons between them generally were unfavorable to the Orient; however, respected institutions like the Oriental Institute of Chicago, the London School of Oriental and African Studies or Università degli studi di Napoli L'Orientale, also carried the term. The word "Orient" fell into disrepute after the word "Orientalism" was coined with the publication of Said's book. Following the ideas of Michel Foucault, Said emphasized the relationship between power and knowledge in scholarly and popular thinking, in particular regarding European views of the Islamic Arab world. Said argued that Orient and Occident worked as oppositional terms, so that the "Orient" was constructed as a negative inversion of Western culture. The work of another thinker, Antonio Gramsci, was also important in shaping Edward Said's analysis in this area. In particular, Said can be seen to have been influenced by Gramsci's notion of hegemony in understanding the pervasiveness of Orientalist constructs and representations in Western scholarship and reporting, and their relation to the exercise of power over the "Orient". Although Edward Said limited his discussion to academic study of Middle Eastern, African and Asian history and culture, he asserted that "Orientalism is, and does not merely represent, a significant dimension of modern political and intellectual culture." (p. 53) Said's discussion of academic Orientalism is almost entirely limited to late 19th and early 20th century scholarship. Most academic Area Studies departments had already abandoned an imperialist or colonialist paradigm of scholarship. He names the work of Bernard Lewis as an example of the continued existence of this paradigm, but acknowledges that it was already somewhat of an exception by the time of his writing (1977). The idea of an "Orient" is a crucial aspect of attempts to define "the West". Thus, histories of the Greco–Persian Wars may contrast the monarchical government of the Persian Empire with the democratic tradition of Athens, as a way to make a more general comparison between the Greeks and the Persians, and between "the West" and "the East", or "Europe" and "Asia", but make no mention of the other Greek city states, most of which were not ruled democratically. Many scholars now use Said's work to attempt to overturn long-held, often taken-for-granted Western ideological biases regarding non-Westerners in scholarly thought. Some post-colonial scholars would even say that the West's idea of itself was constructed largely by saying what others were not. If "Europe" evolved out of "Christendom" as the "not-Byzantium," early modern Europe in the late 16th century (See Battle of Lepanto (1571)) certainly defined itself as the "not-Turkey." Critics of Said's theory, such as the historian Bernard Lewis, argue that Said's account contains many factual, methodological and conceptual errors. Said ignores many genuine contributions to the study of Eastern cultures made by Westerners during the Enlightenment and Victorian eras. Said's theory does not explain why the French and English pursued the study of Islam in the 16th and 17th centuries, long before they had any control or hope of control in the Middle East. Critics[who?] have argued that Said ignored the contributions of Italian, Dutch, and particularly the massive contribution of German scholars. Lewis claims that the scholarship of these nations was more important to European Orientalism than the French or British, but the countries in question either had no colonial projects in the Mideast (Dutch and Germans), or no connection between their Orientalist research and their colonialism (Italians). Said's theory also does not explain why much of Orientalist study did nothing to advance the cause of imperialism. What imperial purpose was served by deciphering the ancient Egyptian language, for example, and then restoring to the Egyptians knowledge of and pride in their forgotten, ancient past? Lewis argued that Orientalism arose from humanism, which was distinct from Imperialist ideology, and sometimes in opposition to it. Orientalist study of Islam arose from the rejection of religious dogma, and was an important spur to discovery of alternative cultures. Lewis criticised as "intellectual protectionism" the argument that only those within a culture could usefully discuss it. In his rebuttal to Lewis, Said stated that Lewis' negative rejoinder must be placed into its proper context. Since one of Said's principal arguments is that Orientalism was used (wittingly or unwittingly) as an instrument of empire, he contends that Lewis' critique of this thesis could hardly be judged in the disinterested, scholarly light that Lewis would like to present himself, but must be understood in the proper knowledge of what Said claimed was Lewis' own (often masked) neo-imperialist proclivities, as displayed by the latter's political or quasi-political appointments and pronouncements. Bryan Turner critiques Said’s work saying there were a multiplicity of forms and traditions of Orientalism. He is therefore critical of Said’s attempt to try to place them all under the framework of the Orientalist tradition. Other critics of Said have argued that while many distortions and fantasies certainly existed, the notion of "the Orient" as a negative mirror image of the West cannot be wholly true because attitudes to distinct cultures diverged significantly. According to Naji Oueijan, Orientalism manifested in two movements: a genuine one prompted by scholars like Sir William Jones and literary figures such as Samuel Johnson, William Beckford, and Lord Byron; and a false one motivated by religious and political literary propagandists. Another view holds that other cultures are necessarily identified by their "otherness", since otherwise their distinctive characteristics would be invisible, and thus the most striking differences are emphasized in the eyes, and literature, of the outsider. John MacKenzie notes that the Western "dominance" critiqued by Said has often been challenged and answered, for instance in the ‘Subaltern Studies’ body of literature, which strives to give voice to marginalized peoples. Further criticism includes the observation that the criticisms levied by Said at Orientalist scholars of being essentialist can in turn be levied at him for the way in which he writes of the West as a hegemonic mass, stereotyping its characteristics. Much of Said's criticism of Western "Orientalism" is based on particularizing trends also present in Asian works by Indian, Chinese and Japanese writers and artists, in their views of Western culture and tradition. The term Occidentalism has sometimes been used to refer to negative or stereotypical views of the Western world found in Eastern societies. Although the core how of Said's criticism of the concept of "Orientalism" implies a Western view of Eastern culture, some Eastern artists adopted Western styles that particularize Eastern peoples. The Indian painter Ravi Varma painted several works that are virtually indistinguishable from some Western "Orientalist" images. In the late 20th century many Western cultural themes and images began appearing in Asian art and culture, especially in Japan. English words and phrases are prominent in Japanese advertising and popular culture, and many Japanese anime are written around characters, settings, themes, and mythological figures derived from various Western cultural traditions. ^ Edward Said and The Production of Knowledge, by Sethi,Arjun (University of Maryland) accessed April 20, 2007. ^ Zachary Lockman, "Contending Visions of the Middle East: the History and Politics of Orientalism" (Cambridge University Press, Cambridge, 2004), p. 205. ^ Kramer, Martin (1999). "Bernard Lewis". Encyclopedia of Historians and Historical Writing. Vol. 1. London: Fitzroy Dearborn. pp. 719–720. http://sandbox.blog-city.com/bernard_lewis.htm. Retrieved 2010-01-31. A Burmese Dancer by James Raeburn Middleton. Recently, the term Occidentalism has been coined to refer to negative views of the Western world sometimes found in Eastern societies today. These views include derogatory or stereotyped portrayals of Westerners. In a similar ideological vein to Occidentalism, Eurocentrism can refer to both negative views of the Orient, and excessively positive views of the Western World, found in discussions about "Eastern culture." Some Eastern artists, such as the Ottoman statesman Osman Hamdi Bey, adopted and adapted to Western styles. 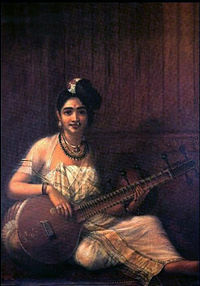 The Indian painter Raja Ravi Varma painted several works that are virtually indistinguishable from some Western "Orientalist" images. 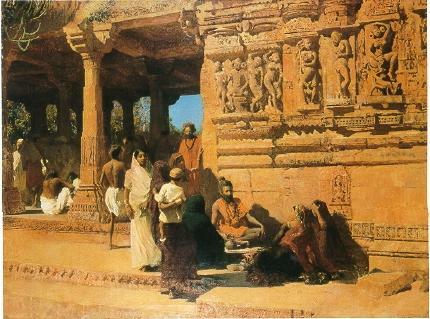 In the late twentieth century many Western cultural themes and images began appearing in Asian art and culture. English words and phrases are prominent in Japanese advertising and popular culture, while Japanese move and television animation are often written around characters, settings, themes, and mythological figures derived from various Western cultural traditions.